With our private half-day Damnoen Saduak Floating Market and Maeklong Railway Market tour from Bangkok, you'll get to visit Thailand's 2 most famous markets in 1 day. 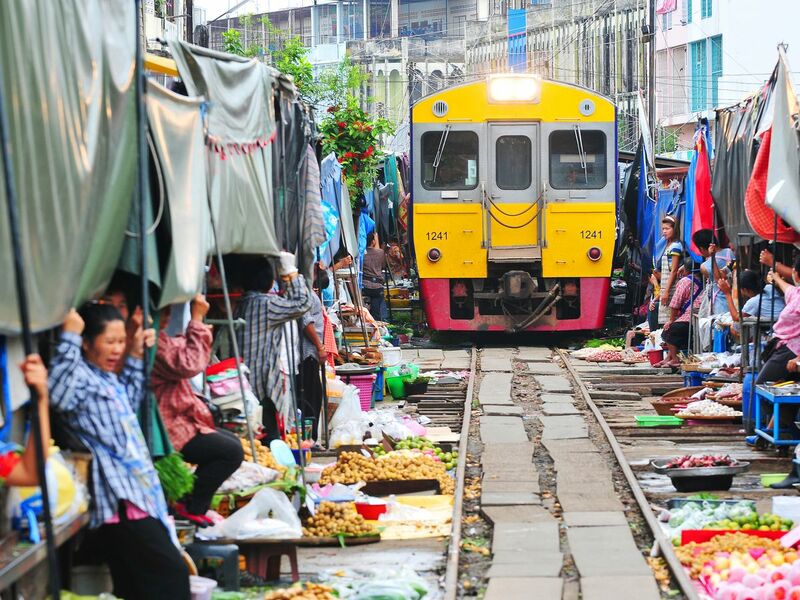 Visit Maeklong Railway Market (Umbrella Market) and marvel at how this fresh market along operating train track works. Then we'll eat and shop at Damnoen Saduak Floating Market, one of Thailand's most colorful floating markets with lots of boat vendors. Start our private Damnoen Saduak Floating Market and Maeklong Railway Market tour at Damnoen Saduak Floating Market. Walk around Damnoen Saduak Floating Market and enjoy the lively scenes along the canal. You'll also get to buy fresh fruits and food from the boat vendors. Time to tour the canal. Take a long-tail boat ride and enjoy the local scenes along the way. Leave Damnoen Saduak Floating Market. Arrive at Maeklong Railway Market (Umbrella Market). The vendors sell their produce along the train track and trains run straight through the market many times every day. See how fast the vendors pull down their umbrellas and pack away their goods to make way for the arriving train! Time for the famous unusual scene that's completely normal for the locals. The train is arriving. Let's take a lot of photos. It's time to go back to Bangkok before the rush hour. You will learn and see many things in Damnoen Saduak Floating and Maeklong Railway Market. This is a perfect day trip for your visit nearby Bangkok. Tun was wonderful! We had a great experience and immediately felt comfortable with our new friend! We learned a lot on our trip and the pace was great. We never felt rushed or short on time. Tun gave us great tips as we navigated the markets and different food offerings. Would definitely sign up with him again so we can see the other markers!